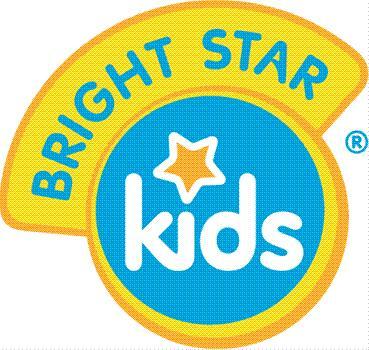 *This post is sponsored by Bright Star Kids. I received free product to facilitate my post. All opinions are my own. Personalized gifts help make children feel special. Every time a child sees his or her name on an item, he/she is reminded just how uniquely special and important they are. They are loved. They are valued. They’re kind of a big deal! Personalized products also encourage early memorization of letters and help children develop the ability to spell, write, and recognize their name. This year, why not surprise a child you love with a personalized product from Bright Star Kids? From wall decals, to name labels, to personalized clothing, Bright Star Kids has a wide array of unique gift options for any child on your list. Bright Star Kids is affordable AND adorable! Their line of wall art makes it possible to customize your child’s room. Order a set of name labels, and never worry about fighting over “that’s MY toy!” again! Each of their product lines feature a ton of super-cute and trendy designs, with the option of adding your child’s name. So many possibilities!! I was able to surprise my little man with a Terrific Train shirt for his 3rd birthday. 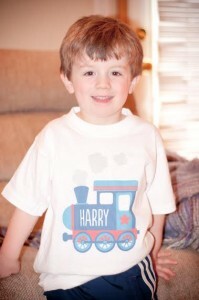 Harry lit up at the sight of his new train shirt. Not only did this super-comfy and quality shirt feature his most favorite thing ever (TRAINS! ), it had his name on it!